While this weblog has long carried links to resources from American Aquarium Products and others, I have not posted an updated article/blog post about what many who keep fish (pond or aquarium) in Grants Pass are missing. "American Aquarium Products" along with its sister site "Aquarium & Pond Answers" have grown into one of the leaders in cutting edge aquarium products (& some pond too). 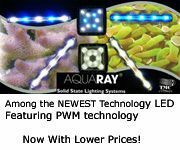 As examples, American Aquarium Products is the largest seller of High End Aquarium LED Lights as well as T2 Aquarium/Multi-purpose lights in North America! Another unique product that American Aquarium has led the way in use, researched tests, & internet promoting are the Wonder Shells Aquarium mineral blocks. AAP has been using these unique mineral blocks that have been shown to improve essential positive mineral ion levels for 30 years, yet many right here in Grants Pass are not even familiar with this product. As well these websites have the most researched aquatic articles found ANYWHERE on the Internet. Many of these articles such as Aquarium Lighting and Aquarium/Redox Balance have received acclaim from around the world (often from researchers outside the anecdotal aquarium/pond keeping industry). There are many more affiliates now of American Aquarium/Aquarium Answers, especially in their other field of expertise; UV Sterilization! American Aquarium Products is an industry leader in both knowledge of UV Sterilizers, Clarifiers as well as having one of the deepest inventories of Premium UV Replacement Bulbs found anywhere (many clients hail from as far away as Australia). What is sad, despite the many research experts, visitors of sponsored forums, and regular clients of American Aquarium Products and Aquarium Answers, these websites are still not well known in their home town of Grants Pass Oregon, but for a few rude emails challenging information contained in the researched articles only to buy products from less than reputable sellers such as DR. F & S (which is well known inside the aquarium industry for their less than honest business practices). It does not help when the local paper (the Grants Pass Courier, AKA the "Daily Discourager") ignores their home town aquatic experts when doing a story about poisonous fish a few years back only to get their facts wrong (of course the media nationwide are on a downhill slide). Hopefully many aquarium/pond keepers will wake up to the internet leader in aquatic information/products in their own back yard before they are lured away (offers have already come in from New Jersey and Texas)to move these internet business base of operations to these states. Basic to in-depth aquarium and pond articles. The most accurate, researched, updated article on the subject of the Aquarium Nitrogen Cycle and cycling found anywhere on the Internet! 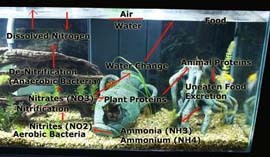 Sound basic freshwater keeping information from someone with decades of aquarium keeping experience with links to more in depth information for those looking to step up in their aquarium keeping knowledge. the MOST in depth and accurate source of information about aquarium treatments, from antibiotics, chemical, to organic treatments and most importantly how to properly use them! Thanks for all the great information Carl! I can't wait to get my pond going this spring!